Do I need a Rescheck, Manual J, or both? | $79 RESchecks & Manual Js. $79 Any Plan. Any State. Do I need a Rescheck, Manual J, or both? One question that we hear alot on our 100% free Rescheck helpline is if our customers need a Rescheck, Manual J, or both. This is very common, because alot of people only build one home in their lifetime. They all share a single trait, they want to do it correctly and not spend an arm and a leg on energy bills every month. First the best way to decide whether you need a Rescheck, Manual J, or both is to discuss what each one is. Your Rescheck Energy Report in basic terms will take the insulation from your roof, walls, foundation, windows, and doors and compare it to your climate zone and building code. After this is compared to the applicable code and zone it will give you a Pass or Fail grade. If you get a Pass you are ready to start construction. If you get a Fail then it might be time to consider beefing up some of your components so that your project will be accepted and your home will be built according to your prevailing energy code. Your Manual J Energy Report will create a separate BTU count for each room in your home. Basically if you have 5 rooms in your home then a well made Manual J would have 5 separate Manual J reports. One for each room. What these Manual J reports do is measure the BTU usage to Heat and Cool each room in the home. It takes the local climate, heat created or lost at different times of day, and your homes insulation envelope and provides an easy to use graph and chart to show you what times of day and what rooms use the most energy. It is also very helpful when zoning a home for different units because you can group rooms that you use the most on one system and rooms that are used sparingly on another system. So now that you know a basic description of what report is, which one should you get for your project. For many jurisdictions the decision is pre-made for you. In order to get a building permit in many places you must have both. Why is this? The importance of building energy efficient structure’s in some areas is so important that they check new structure’s multiple ways before they are even constructed. Some towns only require a Rescheck, and other towns only require a Manual J. I also see many people that their building department does not require a Rescheck or Manual J yet they order both anyways. If you want to know if you are building a home that is efficient enough for your climate zone this is a small price to pay for piece of mind. So if you want to order just the Rescheck for your home we charge $79 for any plan and will have it back to you in 4-6 hours. Similarly if you need just a Manual J Report we will do every room in your home, no matter how large, for the single low price of just $79 and have it back to you in 4-6 hours. If you decide to do both the Rescheck and the Manual J we offer a discounted combination pack that includes a Rescheck and Manual J for each room in your home for only $129. We will have this back to you in about 4-6 hours as well. Overall it is possible to use just a Rescheck, just a Manual J, or nothing at all to show compliance of your home to local codes. We help people every day decide the right amount of insulation their new home, addition, or alteration should have. Probably the safest and most cost effective way to gauge you home against your building code and climate zone is to create both a Rescheck and Manual J and get a good feel for how much energy your home will use before it is ever constructed. To get the process started with us simply email us a set of your plans to [email protected] We will print off a set of your plans, start your calculations, and as soon as your Rescheck and Manual J are complete we will send you a project recap and invoice. 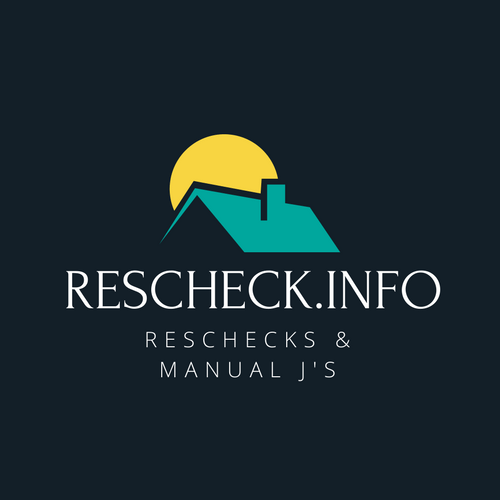 We are the only provider in the industry that allows you to pay after your Rescheck and Manual J are complete. Let us handle your home energy reports today and take the worry out of your construction process. Any questions? Give us a call at 865-235-6277 now.